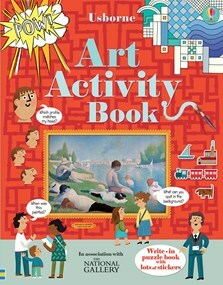 Explore the exciting world of art with this write-in activity book and discover dozens of paintings through puzzles, doodles, stickers, colouring in and things to spot. Each double page features a well-known painting, with snippets of information and fun and creative puzzles and challenges. Children can guide St George through a maze next to Paolo Uccello’s “St George and the Dragon”, add stickers to make a cubist portrait and fill empty frames with their own portraits and patterns. Published in association with The National Gallery, and featuring paintings by artists such as Wassily Kandinsky, Henri Rousseau and Vincent van Gough, and movements including Cubism, Surrealism and Symbolism.